Always a pleasure visiting Dr. Lenoir. Really cares about his patients. And honest about what's best for you. This appointment was for my Senior mother. Dr. Lenoir has a great bedside manner! Really funny guy. I may use himas my regular eye doctor instead of Lens Crafters. Great experience. This appointment was for my Senior mother. Dr. Lenoir has a great bedside manner! Really funny guy. I may use him as my regular eye doctor instead of Lens Crafters. Greatexperience. 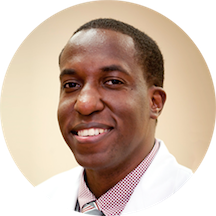 Dr. Andre Lenoir was raised locally in the Stone Mountain area. He received his bachelor of science degree from the University of West Georgia. Following graduation, he then attended the Southern College of Optometry where he received his Doctor of Optometry degree. Dr. Lenoir completed his training at the Indian Health Service in Shiprock, New Mexico and at Vision of South in Columbus, Georgia with Dr. Brel Clark. Through these associations he has developed an strong interest in pediatric eye care. During his training he received extensive experience in pediatric eye care, contact lens fitting, eye surgery co-management (including both cataract and lasik) and adult eye care. Dr. Lenoir is a proud member of V.O.S. H. international whose primary mission is to facilitate the provision and sustainability of vision care worldwide to people who can neither afford nor obtain such vision care. Dr. Lenoir has served on 6 missions trip to date to Honduras, Costa Rica, Jamaica, Ecuador, Dominican Republic, and Mexico. During these mission trips Dr. Lenoir and team has help thousands of local residents and will spend a week giving eye care services and glasses at no charge to those that could otherwise not afford the services. Dr. Lenoir and his family currently resides south of the Atlanta area. Dr. Lenoir enjoys various outdoor activities including running and white water rafting. Very attentive to the needs of each patient. Very happy about the visit. Great first time experience. Dr. Lenoir was very friendly and knowledgeable. I would definitely visit this office again. Ended up leaving because we still had t been seen. Great people skills, the eye test was simple and easy. The whole appointment went smooth. Dr. Lenoir was very professional and answered all of my questions. He really took his time examining my eye and making sure I understood my diagnosis. I would definitely recommend him! My visit was very pleasant. Dr. Andre is professional, knowledgeable and made me feel very comfortable as a new patient. I will definitely be returning. The office don't know about my appointment because no doctors on today,they give to my another appointment for tomorrow . They say de Zocdoc not working right ! ?? After making an appointment with zocdoc and confirming the appointment I went in 30 min before my appt time and the office told me I was not on the books.. I showed them my email confirmation but they didn't do much about it. I won't go back. Waist of time! Dr. Lenoir was awesomely amazing! My appointment was quick, and he was very polite. One of the nicest eye doctor's I've ever seen. He's great.Made my daughter feel very comfortable, we will definitely go back when eye exams are needed! Visit was great! He was very nice and knowledgeable ! Didn't see him saw the other doctor in the office. She was great. Will go back to see her anytime. This is the second time I scheduled an apt w/ ZocDoc, several days prior and had issues with this office. Today I arrived at my apt time @ 10:30 only to be told there wouldn't be a doctor available until 12:30.I received a confirmation email the day before and a confirmation text message @ 9:00 am. The receptionist asked for my confirmation/ I showed her/ she states someone was supposed to call me. She didn't even offer to reschedule the appointment. A similar incident happened on Memorial Day in which I was allowed to schedule an apt only to arrive and the office was closed... I don't know who is dropping the ball, either ZocDoc or Dr. Lenoir's office, but personally I am completely done with the both of them. I went at around 3 and the place was empty. Everyone was nice and helpful! Plan on bringing my son here. Front desk person is rude and doesn't acknowledge your presence other than to say take a seat. Real turn off when that's the first person you encounter. The visit was for my 90 year old mother. I'm assuming her visit with the dr went well. The problem was the receptionist was very unprofessional/ un friendly/ acted like she did not want to be their. , The first thingshe did was to shove the clip board in my face and tell me to fill it out and have a seat, I explained that I had already taken the time to complete the lengthy form, she the mumble something and continued to tell me to take the form and fill it out. , How RUDE., after checking my phone to download the form I took it over to her and she again with attitude said , " I told you I don't see it, our system aint showing nothing. I don't think we will be back and it's just because of people like her. Everyone else was absolutely wonderful and full of smiles. o, how one bad apple can spoil the group. Excellent doctor!! Clean office and helpful staff. Definitely recommend. He was great! Very professional and informative. I did not get to see Dr. Lenoir, but Dr. Thompson was great. When he realized that one eye was not as crisp as the other, he examined my eyes further and to my surprise, I have cataracts. My eyes havebeen examined yearly - this was my first time visiting this office and I will not go anywhere else in the future. Normally I do not write reviews. I HAVE BEE N HERE ALREADY AT LEAST 3 TIMES AND NEVER HAD TO WAIT SO THATS ALWAYS A PERK IN AN OFFICE SETTING! HE WAS VERY THROUGH WITH EACH VISIT. WILL CONTINUE TO COME. Very outgoing doctor with great bedside manner! This is the first visit at this office. Everyone was very polite and courteous. Will return again. It was a pleasant experience! Especially with it being for my 7 year old son. He was very nervous before the appointment. My only issue was the cost of the glasses being expensive, other than that I have not negative comments. The experience was wonderful as it was my 5 year olds first eye exam in an actual office for optometry! The staff was extremely professional and knowledgeable at the same time. The friendly faces were more than a welcomed gesture ofkindness as well...my son truly loved his experience and picked out a cool pair of glasses all under an hour! They really need more help because one girl is doing the job of 4 people and that makes the wait time so long and annoying. Dr. Lenoir is very outgoing and has great bedside manner. He is professional and personal. His staff is also great. They are all nice. Dr. Lenoir was very professional and he made my daughter comfortable and explain his terminology in lame's term so that it was understandable it was greatly appreciated. I would recommend his office to my family and friends.